The wonderful worlds of Pixar will get a new home at Disney California Adventure Park when Pixar Pier opens in summer 2018, transforming the area that is now Paradise Pier with the thrilling, new Incredicoaster, four new imaginative neighborhoods, plus entertainment, themed food and beverage, and merchandise. Guests will experience Pixar stories and characters in incredible new ways on this seaside waterfront at the Disneyland Resort. Pixar Pier, a permanent land along the southern shore of Paradise Bay, will debut during Pixar Fest, a limited-time event that begins April 13, 2018. As a new land, Pixar Pier will introduce the exciting new Incredicoaster plus four whimsical neighborhoods where guests step into beloved Pixar stories. The first neighborhood is inspired by Disney·Pixar's "The Incredibles" and it will open in summer 2018 with the Incredicoaster. Permanently transformed from the attraction that is now California Screamin', Incredicoaster will invite guests into a mid-century-modern-style loading area where they board vehicles with a distinctive, new look. New character moments, new scenes and special effects, and an exciting musical score will connect the attraction's story to Pixar's "The Incredibles 2," which opens in theaters June 14, 2018. 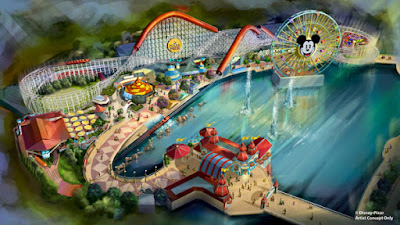 The neighborhood inspired by Disney•Pixar's "Toy Story" will be developed around the popular Toy Story Mania! attraction. Another new neighborhood, inspired by Disney•Pixar's "Inside Out," will debut a new family-friendly attraction that's scheduled to open at a later date. A fourth new neighborhood will celebrate a collection of guest-favorite Pixar stories. Mickey's Fun Wheel will be themed with a new look and each of the 24 gondolas will showcase a different Pixar character. The iconic face of Mickey Mouse will continue to beam happiness across the Paradise Bay side of the wheel. At the Games of the Boardwalk, which currently includes a game called Bullseye Stallion Stampede, guests will find that all the midway games will be inspired by Pixar characters. New games are expected to include characters from "A Bug's Life," "La Luna" and "WALL·E." The remaining areas of the original Paradise Pier – including Paradise Gardens, Silly Symphony Swings, Jumping Jellyfish, Goofy's Sky School, Golden Zephyr and The Little Mermaid ~ Ariel's Undersea Adventure – will become a new land called Paradise Park. The opening of Pixar Pier will add to the fun of Pixar Fest, a celebration of friendship that begins April 13, 2018. Pixar Fest will include the new fireworks show, "Together Forever – A Pixar Nighttime Spectacular;" the return of "Pixar Play Parade," appearing for the first time at Disneyland Park; the return of "Paint the Night," performing this time at Disney California Adventure, and new elements added to each of those parades. In addition, guests will find friends from Disney•Pixar films, creatively themed food and beverage items and merchandise that's exclusive to Pixar Fest. All of these exciting changes add to the many existing experiences that feature Pixar characters and stories. These include Buzz Lightyear Astro Blasters, Finding Nemo Submarine Voyage and Cars Land. The Disneyland Resort features two spectacular theme parks – Disneyland (the original Disney theme park) and Disney California Adventure Park – plus three hotels and the Downtown Disney District, comprising unique dining, entertainment and shopping experiences. The Resort's hotels are the luxurious, 948-room Disney's Grand Californian Hotel & Spa, which also features 50 two-bedroom equivalent Disney Vacation Club units; the magical, 973-room Disneyland Hotel – both AAA Four Diamond properties – and the 481-room Disney's Paradise Pier Hotel with its "day-at-the-beach" theme. For information on attractions and vacations at the Disneyland Resort, visit Disneyland.com, call (866) 43-DISNEY or contact local travel agents. Located in Anaheim, Calif., the Disneyland Resort opened July 17, 1955. Open daily, yearround. Pixar Animation Studios, a wholly owned subsidiary of The Walt Disney Company, is an Academy Award®-winning film studio with world-renowned technical, creative and production capabilities in the art of computer animation. The Northern California studio has created some of the most successful and beloved animated films of all time, including "Toy Story," "Monsters, Inc.," "Cars," "The Incredibles," "Ratatouille," "WALL•E," "Up," "Toy Story 3," "Brave," and "Inside Out." Its movies have won 32 Academy Awards® and have grossed more than $10 billion at the worldwide box office to date. "Coco," Pixar's 19th feature, opens in theaters on November 22, 2017.